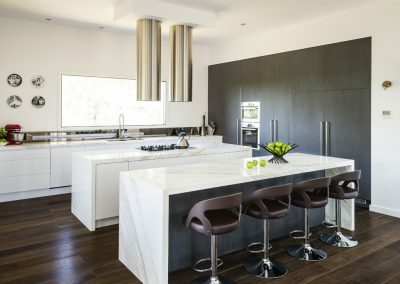 Described by the designers at Smith & Smith Cabinet Makers as being simply magnificent, this kitchen is an example of the exceptional results they can achieve balancing requirements for both living and entertaining. 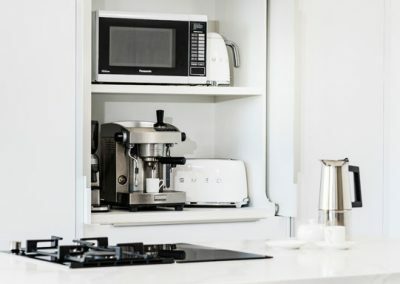 By cutting out the middle man and dealing directly with reputable suppliers such as Hettich, Smith & Smith Cabinet Makers brings their customers quality products at affordable prices. 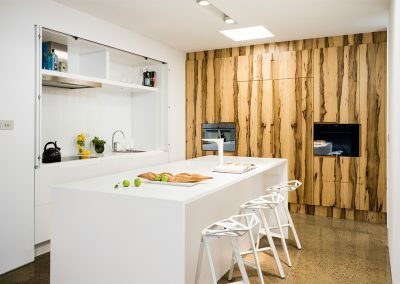 Their standard of quality is immediately obvious in the project showcased here. 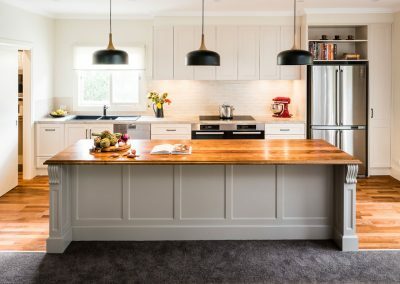 The owners of the property worked with Rob Barclay of Smith & Smith Cabinet Makers over a period of time to bring the owners’ dreams to fruition. 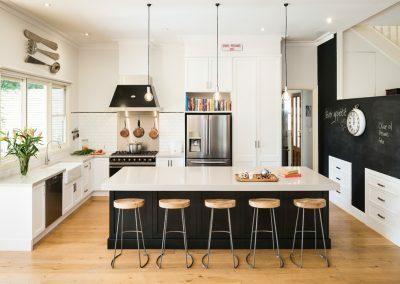 The focal point of the kitchen is the imposing chimney mantle and the elegant island bench. 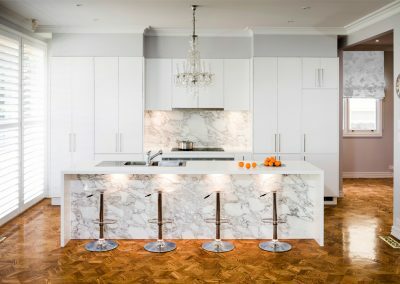 The 2800mm high cabinets accentuate the chimney’s powerful, substantial presence while the island bench is 60mm thick, hand edged from variegated beige marble. 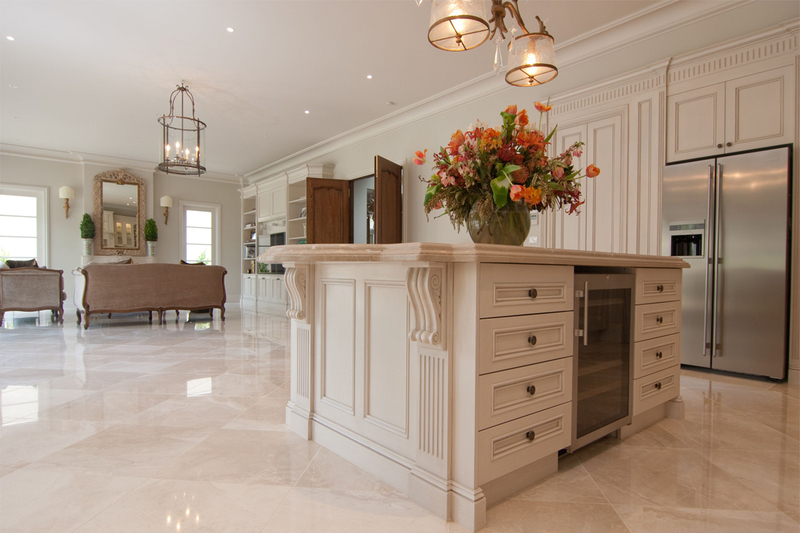 The cabinetry pays homage to those that can be found in the chateaus of France’s Loire Valley. 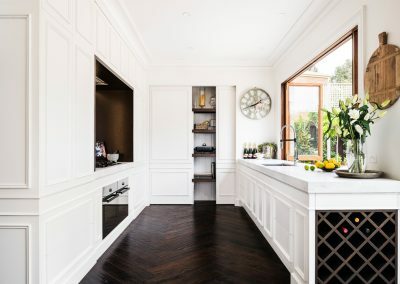 Enhanced by the kitchen’s soft beige walls and marble floors, the cabinetry is accentuated by fluted columns, fluted moulding and decorative kickboards. 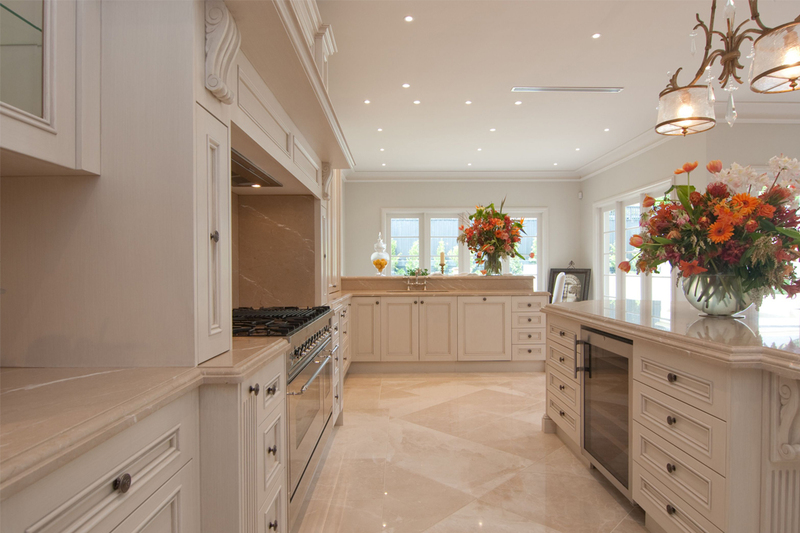 Five separate areas were designed to care for food preparation and presentation with accompanying storage. 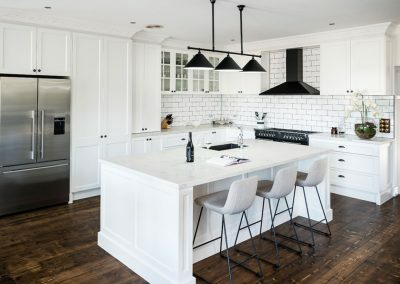 This allows whoever is cooking the ability to deliver meals whilst the guests can be seated in the kitchen at the island bench without interfering. 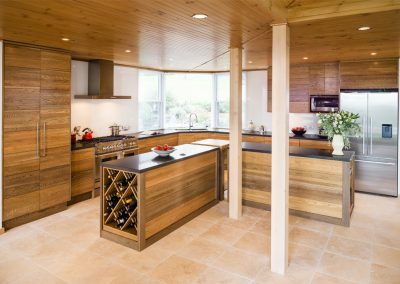 Constructed from solid American oak, all doors and panels in the 7.5m x 4.5m kitchen were hand painted and feature bolection moulding. 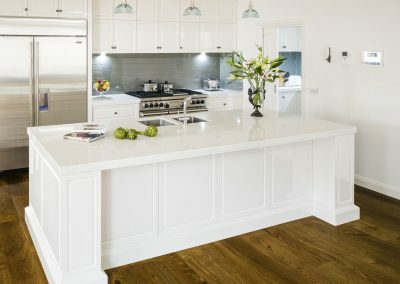 The whole kitchen was then hand waxed, and all grooves were hand shadowed to suggest an aged appearance. 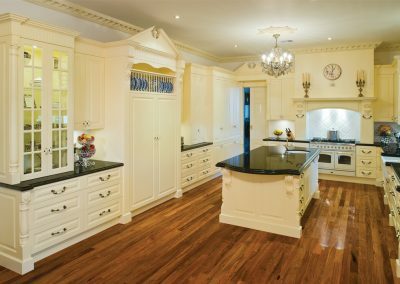 With more than 29 years experience in the industry, Smith & Smith Cabinet Makers know their craft. 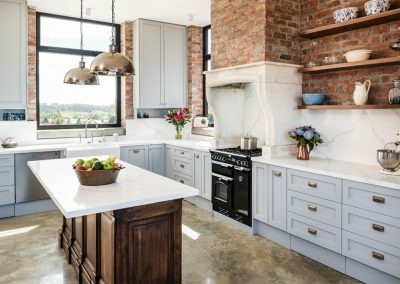 “Our aim is to provide our clients with kitchens that we ourselves, as cabinet makers, would be pleased to have in our own homes, at a price we would be willing to pay,” says John Lorych from Smith & Smith Cabinet Makers. Hettich is one of the major hardware manufacturing companies in Germany where it has access to a large European market, enabling the company to be a leader in many areas of hardware design and innovation. 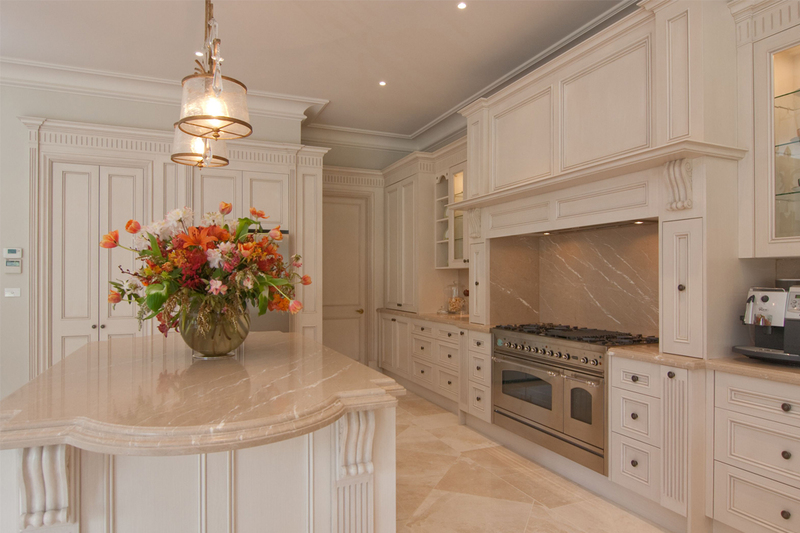 The team working for Smith & Smith Cabinet Makers is the most important asset of the firm. 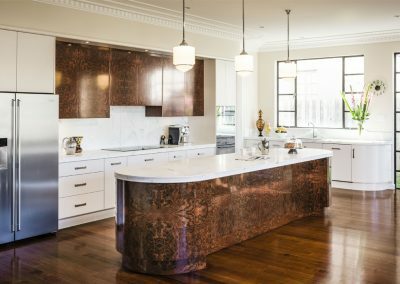 The designers are HIA NKBA certified or qualified interior designers — in some cases, both. 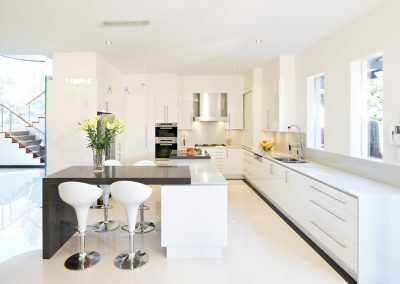 “We have our own team of tradesmen, so our professional staff can co-ordinate a kitchen renovation from start to finish and remove the stressful process of dealing with tradesmen and builders,” says John. 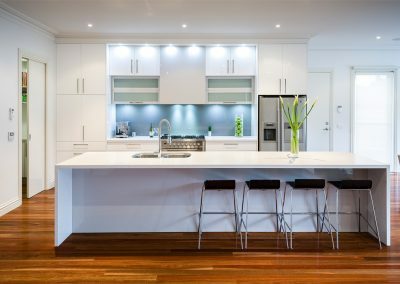 Smith & Smith Cabinet Makers has also recently taken over the business of “Harvey Norman Renovations” in Victoria. 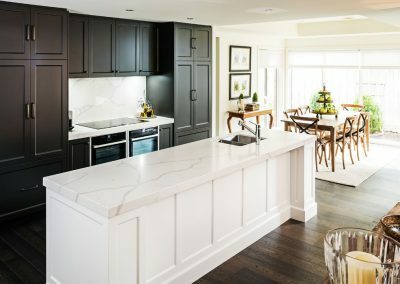 Partnering with companies such as Hettich allows Smith & Smith Cabinet Makers to provide their clients with the best hardware and materials around – cementing Smith & Smith Cabinet Makers as a market leader in the cabinet making industry.